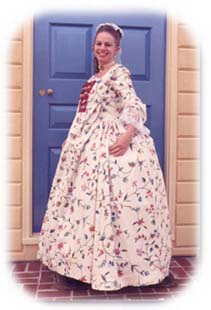 This is perfect for historic house guides or for those who want the Colonial look for a special event at a historic site. 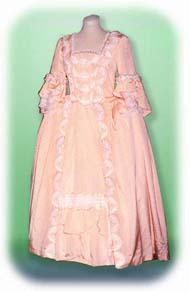 The bodice has a square neckline and is edged with lace and the elbow length sleeves are finished with a ruffle of fabric and lace. 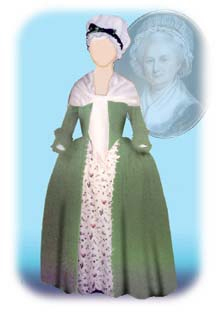 The full skirt is gathered into a natural waistline with a pointed front and has a contrast front panel. 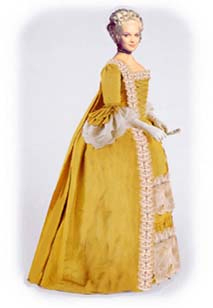 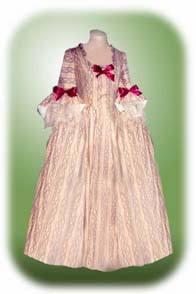 The gown has a back-laced placket closing. 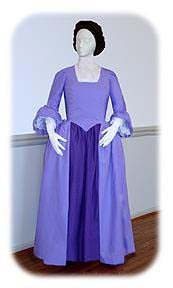 The skirt is approx 42" long all round with a basted hem, which can be worn 'as is' or shortened by the wearer. 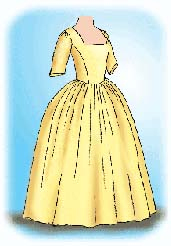 This dress is NOT made to be worn with panniers.